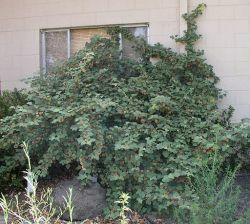 Comments: Broadleaf evergreen shrub native to the Sierra foothills of California. 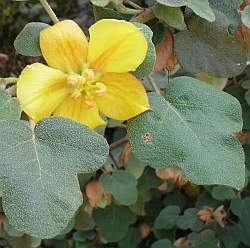 This species has small, 3", deeply lobed, hairy, dark green leaves, showy yellow flowers in Spring and gray bark. Seldom growing taller than 20', this shrub was collected during John C. Fremont's exploration party in 1845, and brought back to Washington D.C. for identification. The species is related to the Monkey Hand tree of central Mexico.